Samsung Galaxy S6 and Galaxy S6 edge are among the most important product launches for the company in quite some time. At a time of unprecedented levels of competition, the duo has the task to bring back the good times for the Korean giant. The past quarter has been difficult for Samsung's mobile division. Its market share and profits declined for the first time in years due to increased pressure from the likes of Apple, LG, HTC, Huawei, and Xiaomi among others. Galaxy S6 and Galaxy S6 edge are Samsung's answer to the competitors and, at quick glance, the newcomers are ready for the challenge. Here is a look at their key features and specs. Developed under the codename Project Zero, Samsung Galaxy S6 and Galaxy S6 edge are a massive leap forward for the popular flagship smartphone family. As usual, the devices are brimming with high-end tech but this time around they have a mature enough design language to complement them. The brand new 14nm Exynos chipset with 64-bit architecture could well be the most powerful in its class at the moment. Samsung has paired it with the fastest flash memory available at the moment. As expected from a new Samsung Galaxy S smartphone, an upgraded 16MP camera with OIS and Super AMOLED displays with eye-popping pixel density are also on board. Both Galaxy S6 components are the best Samsung has utilized to date. 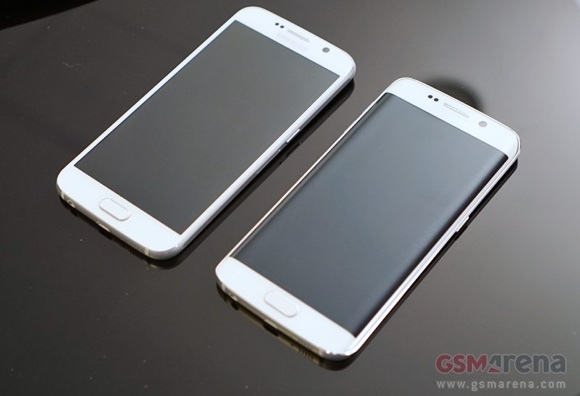 The looks of the two new Galaxy flagships are certainly an improvement Samsung's previous efforts. With glass front and back encased in metal, the ultra-thin Galaxy S6 and Galaxy S6 edge look as premium as it gets. Samsung has also streamlined the TouchWiz UX which runs on top of Android 5.0.2 in a bid to reduce the overwhelming amount of settings from past iterations. At a quick glance, the latest custom UI from the company is a great match for the Material Design of Google's latest Android iteration. Samsung has skipped the removable battery and the microSD card slot for the first time in the lineup's history. The features have been replaced with ample built-in storage options and wireless charging support out of the box. 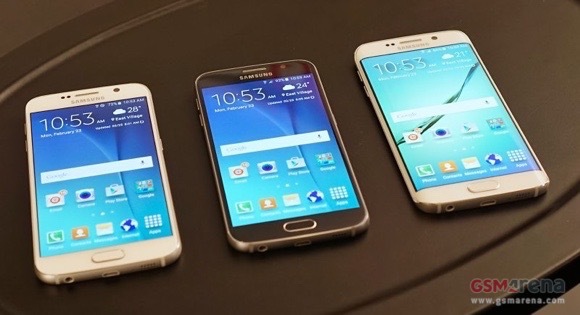 Following next is a closer look at Samsung Galaxy S6 and Galaxy S6 edge. The back of the _phone_ is where the lightly protruding 16MP f/1.9 main camera with 4K video resides. It features optical image stabilization, so the expectations for its low light performance are high. Samsung Galaxy S6 edge is the stunner in the couple. Its dual curved display makes it look unlike anything else on the market at the moment. It is important to note that, despite the design similarity, the display of Galaxy S6 edge has different setup than that of Samsung Galaxy Note Edge. The newcomer's screen is conventional - its curved glass cover produces a 2.5D effect. The Korean giant has worked closely with Corning to develop the smartphone's curved glass. The latter's shape requires a specific temperature to achieve. Samsung has taken advantage of the unique display design by implementing clever gesture controls. For example, you can pull your favorite contacts by swiping from the right edge. Despite packing a 5.1" display, Samsung Galaxy S6 edge feels incredibly easy to handle. Both edges of the display can give you color light notifications for specific contacts when the _phone_ is facing down. Touching the fingerprint sensor during such call will send a pre-selected message to the caller. The camera is the same as the one found in Samsung Galaxy S6. The amount of features it offers should satisfy even the most discerning mobile shutterbug. Samsung Galaxy S6 edge will be available in four colors - White Pearl, Black Sapphire, Gold Platinum, and Green Emerald. The green shade is particularly attractive in the flesh and unique for the model. Because of its curved display, Samsung Galaxy S6 edge has its SIM card slot sitting on top, next to the IR blaster. The rest of the device's controls are the same as those of the "regular" Samsung Galaxy S6. Samsung Galaxy S6 edge measures 142.1 x 70.1 x 7.0mm. It weighs 132 grams. Samsung will naturally offer a host of original accessories for its latest offspring. They include see-through cases that aim to showcases the design of Samsung Galaxy S6 edge. Both Galaxy S6 smartphones use 16MP rear cameras with F/1.9 aperture and bright LED flash. Both devices also pack a front 5MP snapper with the same F/1.9 lens, which means better results in low-light conditions. We are sure many of you are eager to check the performance of both snappers and now we can help you with that. Here are the official camera samples taken with the rear camera of the Galaxy S6. And here are some official shots taken with the front 5MP snapper. We also tried out the HDR mode on the Galaxy S6. Samsung had a dimly lit setup to test the low-light performance of the Galaxy S6's new camera. With a Galaxy Note Edge and a Apple iPhone 6 on hand we snapped a couple of shots. The Galaxy S6 has a Sony IMX240 image sensor like the Galaxy Note Edge, both have OIS, but the new flagship has a wider aperture - f/1.9 vs. f/2.2 - which should give it a leg up. And you may also want to check out this 1080p video shot with the rear camera of the Galaxy S6. The Samsung Galaxy S6 camera can do HDR in video too, here's a quick demo of what an effect it has. The Samsung Galaxy S6 has optical image stabilization and Samsung was so proud of it that it created a mechanical setup where you can pit any handset against the new flagship. We had an iPhone 6 in our pocket (sadly, no iPhone 6 Plus) so we went for it. The iPhone 6 has one of the best software image stabilization around. The camera indeed looks quite promising. We'll be passing judgments once we got our hands on a retail unit, but we are settings out hopes high for sure. The Galaxy S6 and Galaxy S6 edge are the first two smartphones with a 14nm chipset, Samsung's Exynos 7420. Both are running a Samsung-customized version of Android 5.0 Lollipop. The rest of the phones we've picked for this comparison were running Lollipop too (some modified, some not), except for the Apple iPhone 6 Plus, which was on iOS 8, of course. On the CPU side, Samsung put four Cortex-A57 cores at 2.1GHz and four Cortex-A53 cores at 1.5GHz. That's almost the same setup as the Snapdragon 810 found in the LG G Flex2 and HTC One M9 (except the A57 cores are clocked at 2GHz), but Samsung's manufacturing advantage (14nm vs. 20nm) should produce less heat and thus less throttling. The Samsung Galaxy S6 and S6 edge open with massive wins in Geekbench (a CPU benchmark) and AnTuTu (an overall performance bench). Basemark OS II, another full system test, is not nearly as impressed with the new chipset and places the LG G Flex2 and its Snapdragon 810, while the Exynos 7420 and Galaxy S6 drop towards the middle. We move to GPU testing. Exynos once again calls on ARM for the hardware, while Snapdragon 810 uses Qualcomm's own Adreno 430 chips. The iPhone 6 GPU comes from PowerVR, GX6450 to be precise. 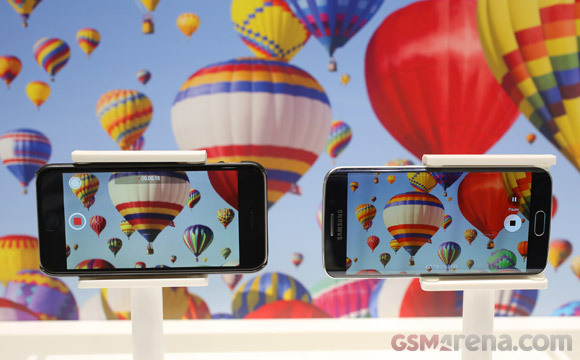 The Galaxy S6 pair also uses a QHD screen  1,440 x 2,560px  while most of the rest are at 1080p (except the Nexus 6 and LG G3). 1080p is close to half the number of pixels compared to QHD, so look at off-screen benchmarks to compare raw power and on-screen scores to compare gaming performance. Mali-T760 seems evenly matched with the Adreno 430 and is enough to offer a playable framerate for games with GFX 2.7 level graphics. The Samsung Galaxy S6 duo will launch on April 10 so the time for tuning the software is running short. The overall difference isnt that huge, but we still see why Samsung was keen to go with its in-house chip. Given the right workload the Exynos can come ahead of Qualcomm's top dog. It's also well-suited for modern games even with the screen's resolution jump. We captured a short video to showcase Samsung Galaxy S6 and Galaxy S6 edge. See it below. We reckon that the duo will start a massive upgrade cycle for Samsung and rightfully so. The new products carry an aura of desirability at first sight, which is deservedly impressive.